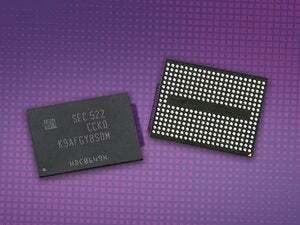 The SSD is targeted at high-end PCs, and the drive is based on Samsung's second generation V-NAND technology, in which storage chips are stacked vertically. Samsung also announced 128GB, 256GB and 512GB capacity SSDs. The 1TB drive could ratchet up SSD storage in laptops, which have so far largely topped off at 512GB. The new SSDs have two times the durability in writing data and are 20 percent more power efficient than conventional NAND-based SSDs in which storage modules are placed side by side, Samsung said in a statement. Prices for the SSDs were not immediately available. Samsung has improved on its original V-NAND technology, stacking 32 NAND storage layers in one chip package. The first-generation of V-NAND, announced in August last year, stacked 24 storage layers. The layers transfer data through a proprietary interconnect. Chip stacking is already found in memory chips and system-on-a-chip devices. Putting storage chips in a vertical structure is viewed as the new way to add storage capacity as devices get smaller and more power-efficient. Samsung later this year plans to announce new drives that are more reliable based on the new V-NAND technology, the company said.